The discussion began with a question: Who, other than William Marlow (1740–1813), could have painted 'Hulks of Sheerness', an oil on panel at the Government Art Collection? 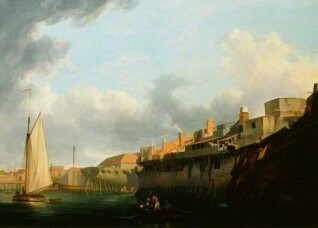 A previous discussion confirmed the title of the painting, and identified the location as the north side of Sheerness Dockyard: model of the yard is held in the National Maritime Museum. Pieter indicated the bright palette to be similar to a lot of Samuel Scott’s work, though his Thames subjects are often more grand and staged. Pieter suggested the painting should be either 'attributed to Samuel Scott', or 'circle' or 'style of' Samuel Scott': it resembled a work by Scott at the Tate. Government Art Collection agreed that Samuel Scott's A Morning, with a View of Cuckold's Point, as well as the other views by his followers, are very similar to the painting in question. They requested the attribution be presented as 'circle of' or 'style of’ Samuel Scott (c.1702–1772). Who, other than William Marlow (1740–1813), could have painted 'Hulks of Sheerness'?